Research doesn’t stop when winter weather hits the coast. As flowers poked up from the ground in Vancouver, it was easy to smugly tease those stuck in the polar vortex out east. Then a winter blast hit the BC coast. But not even winter’s karmic retribution could slow down Hakai researchers. On the BC Central Coast, two Hakai divers geared up as the eight-meter R/V Good Hope crunched its way through a centimeter-thick skin of sea ice that had formed overnight on Pruth Bay. While far from ideal, the divers took stock of the situation before deciding it was safe to take the plunge. Derek and the crew are used to diving in water temperatures between 7 and 11 °C. 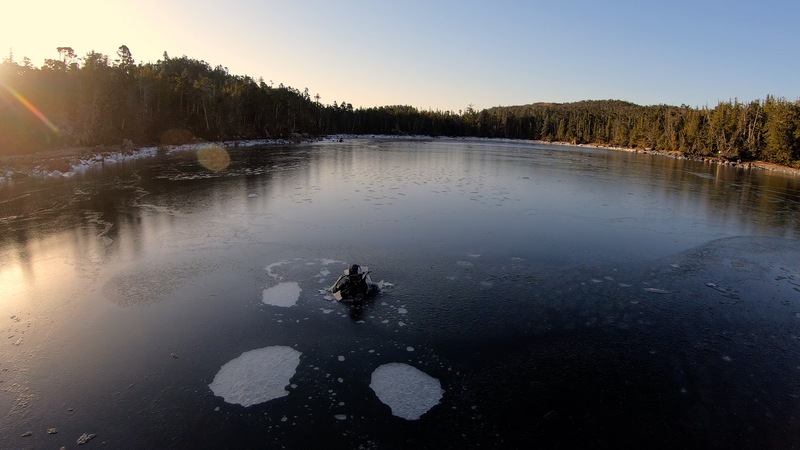 Nothing a drysuit and a few fleecy layers can’t handle. But on the day before Valentine’s Day, Pruth Bay was a teeth-chattering 3 °C. 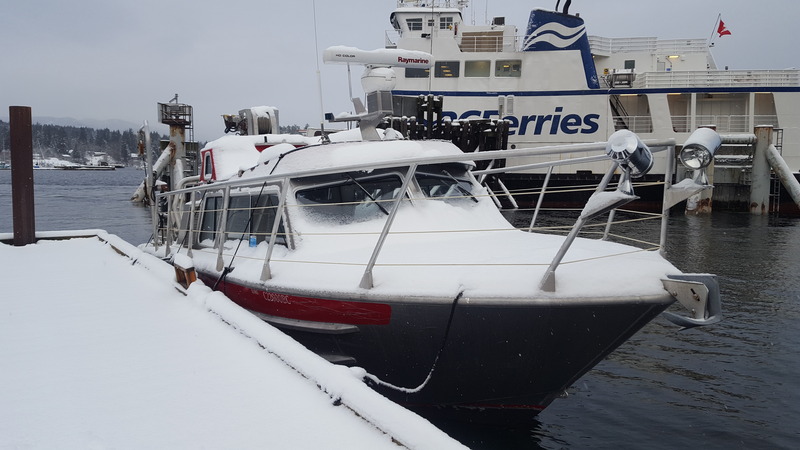 Meanwhile on Quadra Island, 250 kilometers southeast of Pruth Bay, Hakai’s oceanography team scraped snow and ice off the bow of the R/V Hakai Express. While they didn’t encounter any sea ice, air temperatures were far from warm. There’s no reprieve in sight, as the coastal cold stretch is forecast to continue for at least another week. No matter the conditions, the hardened Hakai team will be ready.